Personal Loan Agreement template can be used if you have the need to lend or borrow money from someone, and not from a bank or other financial institutions. This agreement lets you have a legal documentation of the transaction that is carried out between you and the other party. The date that this Personal loan agreement is being made effective. The Name of the Borrower along with his address. The Name of the Lender along with his address. The amount of time (in months) within which the Borrower promises to pay the Lender, and the Amount of Money which the borrower will pay along with interest and any other charges as stated in this agreement. 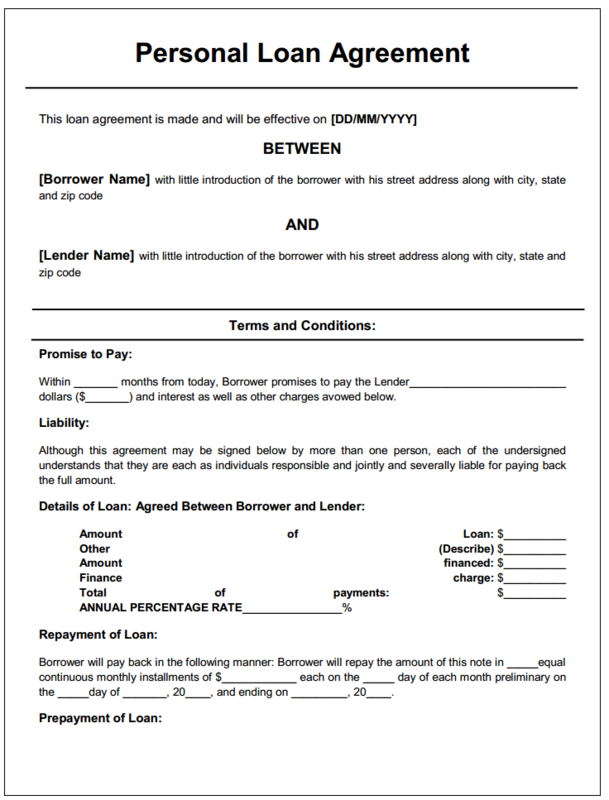 Liability belongs to every borrower who signs this agreement (if there are more than one person borrowing money) and they are all responsible in paying back the loan. Details of the loan regarding the principal amount, the sum total of the payments, and the annual percentage rate to be applied to the principal loan amount. Terms of repayment of the loan like; the manner in which the loan will be repaid, i.e. the number of monthly installments of a certain amount, and the day of the month on which these installments have to be paid. Terms for prepaying the loan amount before the predetermined date. Details of any late charges applicable on the non-payment of the monthly installments. Any collateral that the borrower will give to the lender as a security. Terms related to Failure in paying, and the amount of interest that will be overcharged in the unpaid balance every year. The fees that the borrower agrees to pay if a legal representative is appointed for the collection of the monthly installments. All co-borrowers are likewise accountable along with the borrower for this loan. The Agreement needs to be witnessed by signed by both the Lender and the Borrower (borrowers if multiple). It also has to be two witnesses and signed for it to be valid.